Every year at this time, thousands of college students flock to the beaches of Florida, Cancun and South Padre Island for a well-deserved break from studies and some fun in the sun. Other students, however, use the break as an opportunity to serve others. 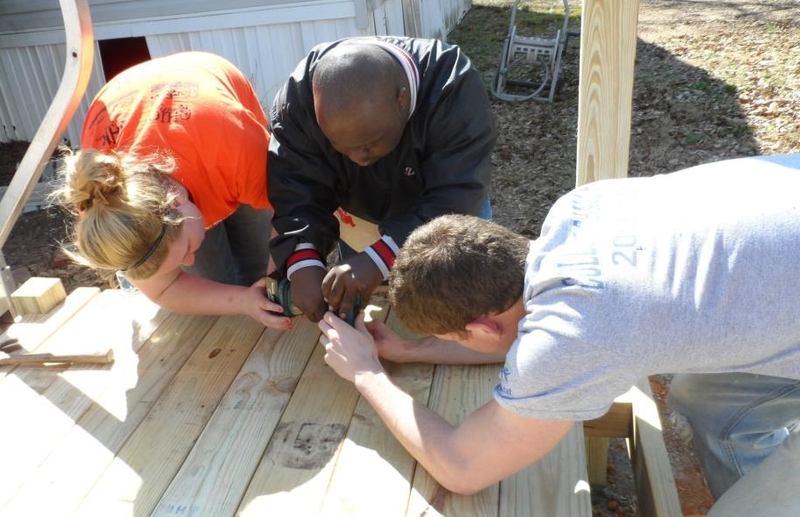 At least 16 teams of college students are spending their spring breaks working with Fuller Center for Housing covenant partners in places such as Louisiana, New Jersey and Georgia, where the Partnership Housing movement was born. Among them are five students from Ohio University who are working with the Americus-Sumter Fuller Center for Housing in Americus, Ga., where they also are getting a chance to learn about the movement Millard and Linda Fuller started more than 40 years ago and about how The Fuller Center is carrying on the Fullers’ grass-roots affordable housing ministry today. 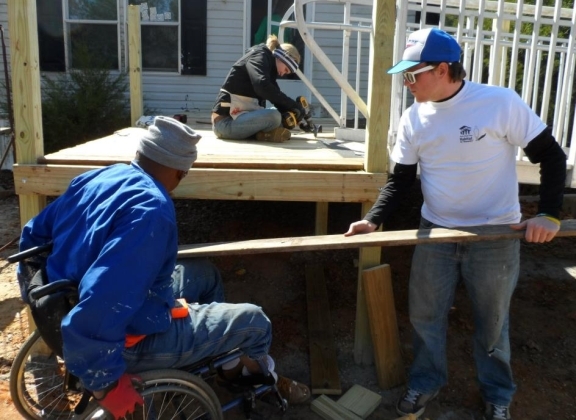 They have been building a wheelchair ramp (donated by Georgia Southwestern State University) at the home of Carolyn Cokley and her son John. John, who has Down Syndrome, has gotten a thrill out of meeting the students who are making sure to involve John in the work. We’re with the OU chapter of Habitat for Humanity, and this is my third trip now. I’ve just fallen in love with doing the service work and getting to be with my fellow Habitat for Humanity peers, and we love working with The Fuller Center because we’ve never done a project with them before. … It is more the original grass roots that Millard Fuller intended. I’ve enjoyed it a lot. And I’ve really liked all the people I’ve worked with on the build site. The family has been great. It was really special yesterday because I got to teach (John) how to use the drill. That was a really great moment for me. I decided that it would be a lot more meaningful to spend my spring break helping construct a wheelchair ramp and work on houses than going and getting drunk with friends in Florida. I thought this sounded a little bit better for me. I went to Winston-Salem, North Carolina, this last winter break in January, so that was my first trip and this is my second. It’s a lot of fun. The reason we’re here this week is we wanted to do an alternate spring break instead of going somewhere nice and warm. We decided to volunteer with The Fuller Center for Housing and make a difference in Americus, Georgia. I’ve actually done seven of these kinds of trips; six of them have been with Habitat for Humanity, and this is my first with The Fuller Center. I knew that after he left Habitat Millard Fuller went and created The Fuller Center for Housing. I really wasn’t aware of how it kind of differs from Habitat for Humanity as far as the religious aspects, that it’s more back to the roots. I really like volunteering, whether it’s helping out in my community or going somewhere else for spring break or a week during the winter. I like helping people that need it. Basically we just came down from OU to help out families. We think Georgia’s warm, too! It’s snowing pretty hard at home right now, so this weather is nothing. I just feel like with my spring break, I really wanted to be productive and help people. I’m a social work major, so volunteering is something I always do. I just didn’t want to sit at home and do nothing. I’ve been volunteering with Habitat for Humanity for a while, but I didn’t know about The Fuller Center so it was interesting to see the similarities and the differences between them. It’s so interesting to see all the different things and the stories of how it all began. It’s the first time I’ve been to Georgia. I come from a really small area like this, so I like to think big things come out of small areas. View more photos of the Ohio University students at work by clicking here. Learn more about our Student Builders program.